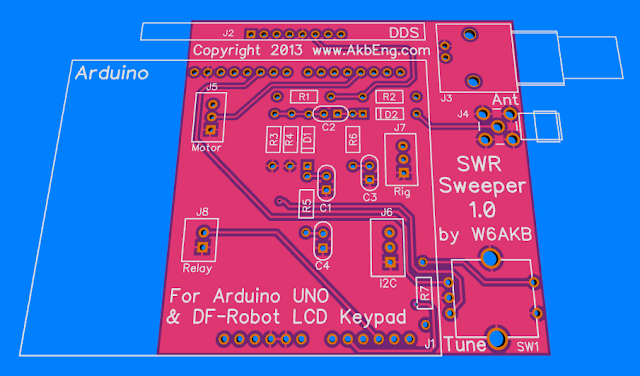 I've made a layout for the SWR Sweeper PC Board 1.0. It has been sent to fab for a few prototype pc boards. 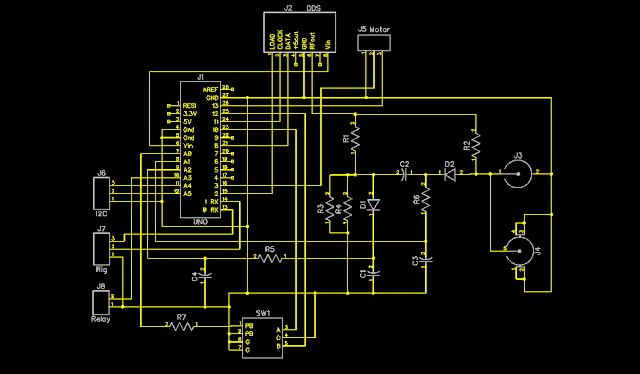 This is essentially the circuit out of the ARRL book minus the voltage regulator. A few improvements: the encoder is wired up, and there are connectors provided for some potential expansion of this project. This SWR Sweeper Shield board sits on top of an Arduino UNO, and the DFRobot LCD board sits on top of it. The Sweeper Shield sticks out to the right and upward beyond the LCD board so the DDS-60, RF Connectors and Rotary Encoder will be accessible. The Sweeper Shield doesn't cover all of the left hand part of the Uno, it just covers the connectors that we need to use. It is all through-hole parts so easy to build. It should turn this from a weekend project to an afternoon project, at least for the hardware. Updated software will be provided on the website to make that part easier as well. I want to take this project forward and do some of the things hinted at in the ARRL Arduino book. You have an opportunity here to provide input on this. In this posting I will collect details about this first board and get input on future versions of the board in the thread that follows. This posting will be updated with more detailed info in the future, be sure to refer to it again later. If you have comments or questions please feel free to post them below. The PC board follows the book article and then extends it slightly in several components. SW1 is a rotary encoder with push-in switch that may be used in the future for tuning or other user interface purposes. It is not supported by the existing software from the book article. C4 is a power supply bypass capacitor that I added to the PC board. I would use a 0.1uF there, but it is not critical and was not in the prototype. R7 is not used at this point. It is a voltage scaling resistor for the pushbutton function of the rotary encoder, adding it to the existing pushbuttons of the SDRobot display board. The buttons are multiplexed onto a single analog input pin and recognized by the voltage ratio, so we will have to select a value that will produce a voltage distinct from the existing ones (unless we we want it to be recognized as an equivalent for one of the existing buttons) when we get ready to use that feature. The current software does not support this rotary encoder, so this part is not needed yet. J4 is an additional SMA type connection in parallel with the BNC. You could load either or both, depending on your preference in RF connections. J5-8 are extra connectors added for possible future expansions. They are not used or supported in the software at this point. The idea is to use them to communicate with a radio, control an antenna relay, and adjust a motor-tuned antenna to match the frequency the radio is on. J5 is an additional connector that could be used to communicate with a motor control. J6 is a connector for communicating via I2C to other components or subsystems. J7 is a connector for communicating serially with the Radio. This use overlaps (uses the same Arduino pins) with the serial connection to the development environment, so both cannot be done at once. J8 is a connector that could be used to communicate with a remote relay that would be used to switch the antenna from the radio to the SWR Sweeper board. This could be used to facilitate automated antenna tuning. The photo album contains these and other related photos at various resolutions (including higher resolution so you can read the schematic). I have a few printed circuit boards available. PayPal $15 in USA, $16 foreign to sales at akbeng dot com, please indicate 'swr sweeper PCB' in the comments so we send the right pcboard. Using http://www.DipTrace.com software and http://www.OSHPark.com fabrication for prototyping. If you are looking for an easy way to design and make low cost high quality PC boards, check these out! Last edited by w6akb on Tue Jul 29, 2014 2:01 pm, edited 6 times in total. So far it has been tested for mechanical fit and everything has passed. Electrical and software testing will begin soon. The Sweeper is much more compact with this board than the original prototype developed for the article. A right angle socket can be used for the DDS to make the package compatible with a box. Then I have some plans to go beyond the article and develop software to auto-tune motorized antennas such as Screwdriver and Small Transmitting Loops with this hardware (some additional hardware will be required). Your co-contributor Hans Summers, G0UPL, recently released his Ultimate 3 QRSS kit based on the above AD9850 module. The disadvantage of these modules if that they don't have the RF Amp and LPF that the DDS-60 does, but those could be added externally. I like the layout of your PCB and would be interested in buying one (or a kit), but it would be a shame if it was dependent on the DDS-60 module that is intermittently available from only a single supplier. Thanks for your comments, Cai. It is nice to know someone is actually out there. It was my understanding that DDS-60's were still available assembled, but I have not checked recently. The amplifier is required, the bare output is pretty low level, and the harmonics will cause problems. We've been considering some changes, may have to look into that, but building the DDS is a bit of a challenge due to surface mount parts. I did build mine, but are folks prepared to do that? The amp would be a bit easier, does it make sense to be dependent on ebae parts for the DDS part? They are somewhat variable. I can't even look at the pictures at work, so not sure what that one looks like. I haven't had much response on these boards, wonder how many folks are even interested. I'm interested in the board. What is the current status of this. Presently I am out of PC boards, if there is interest I can have another batch made. There has been very little interest. Would it be possible for me to make the minimum 3 board order directly with OSH park? I plan to order a small batch shortly. I would love to get a couple boards, please. Any idea of pricing yet? I'm in for at least 2 boards.